Many freeways in Texas are wide open roads where high speeds can be great fun. 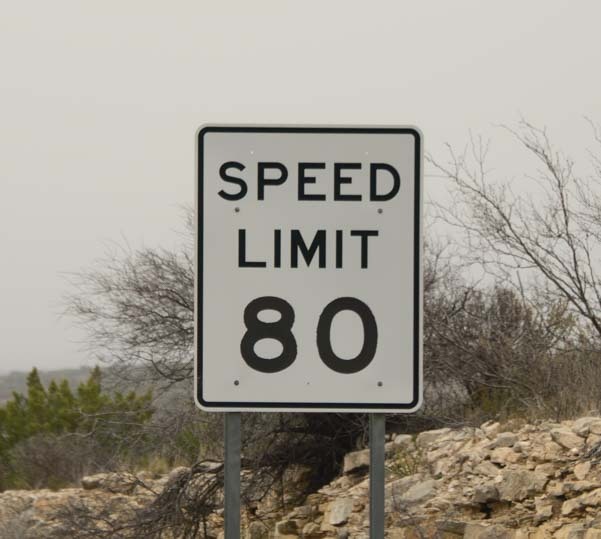 The 80 mph speed limit, with its unwritten 10 mph grace zone above that, is a temptation for many. We prefer to jog along at 60 mph in the right lane when we’re towing our house around, but our slow speeds put us in the minority in this part of the country. 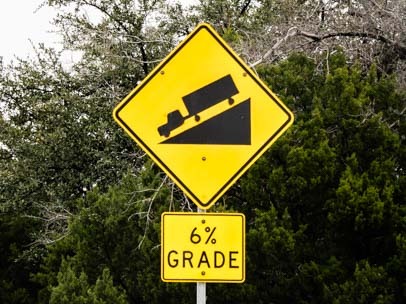 Texas highways move at a good clip! Last Friday, a nasty winter storm swept through the Dallas/Fort Worth area, sending trucks and cars careening off of the freeways on a virtual skating rink. We first heard of the chaos in the small town of Marathon where we saw frightening images on TV at a gas station and listened to scary tales from motorists seeking safe haven on their way from Dallas to Big Bend. We drive through the remnants of a vicious winter storm 2 days earlier. We had hightailed it out of Big Bend National Park after enduring below freezing temps for 48 hours. 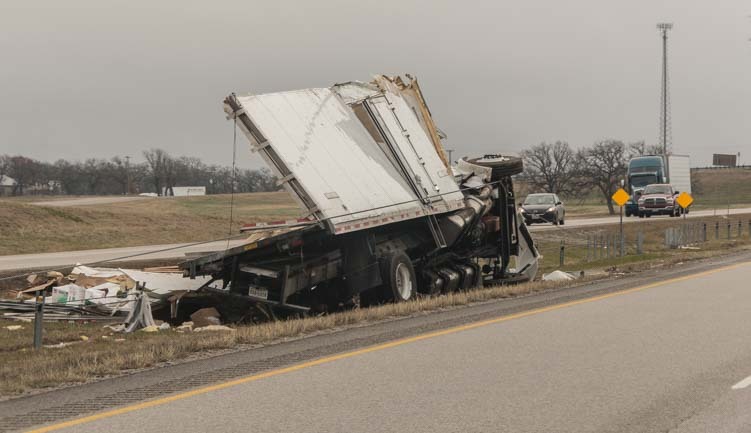 When we got onto I-20 about 100 miles west of Fort Worth, we began to see the remains of the ice storm from two nights before. The trees were filled with ice, and mist hung heavy in the air. 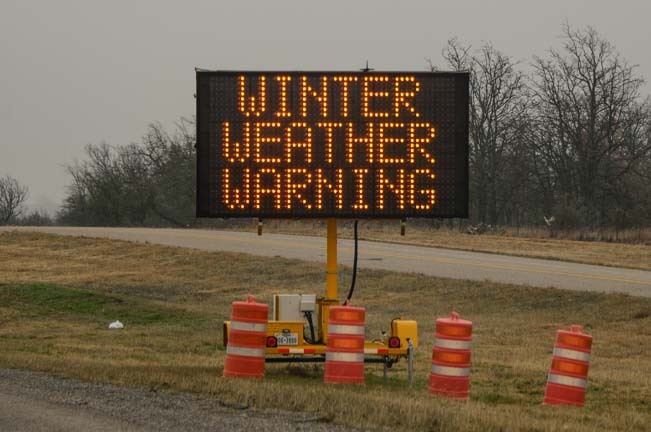 A Winter Weather Warning was in effect for another incoming storm due to arrive the next day. Ugh…we won’t be warm any time soon! 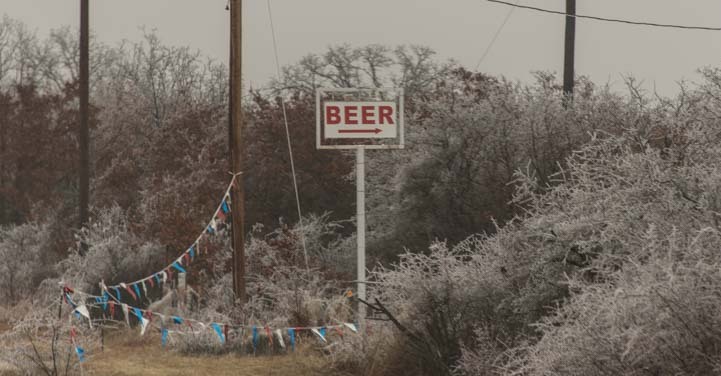 I began snapping pics as we drove, just to keep myself occupied, and a small Beer sign in the wintry woods made me smile. This stretch of freeway is basically a truck route, with the occasional car or RV filling in around the fringes. Trucks were everywhere, ahead of us and behind us. I-20 is a major truck thoroughfare. These guys don’t mess around, and they seem to view the high speed limit as an open invitation. And why not, when you have a tight delivery schedule to keep? We were passed by one semi-tractor trailer truck after another until we felt like the old grannies of the road. Truckers get impatient with our slow little buggy. When an “Oversize Load” truck passed us like we were standing still, and remained in the left lane until it vanished from sight ahead of us, all I could think was that we were experiencing the modern day Wild West of Texas out here on the freeway. An “Oversize Load” passes us and stays in the left lane until he disappears out of sight. Holy smokes — it’s a semi-tractor trailer on its side! It was an overturned semi-tractor trailer that had obviously been one of the victims that slid off the road on the ice. 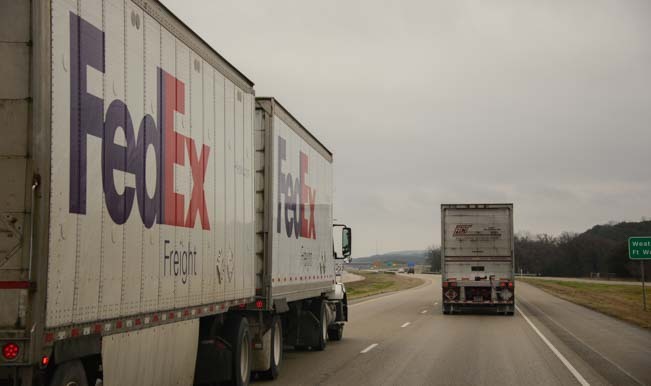 A few minutes later a Fed Ex truck facing the wrong way in the median caught our eye. 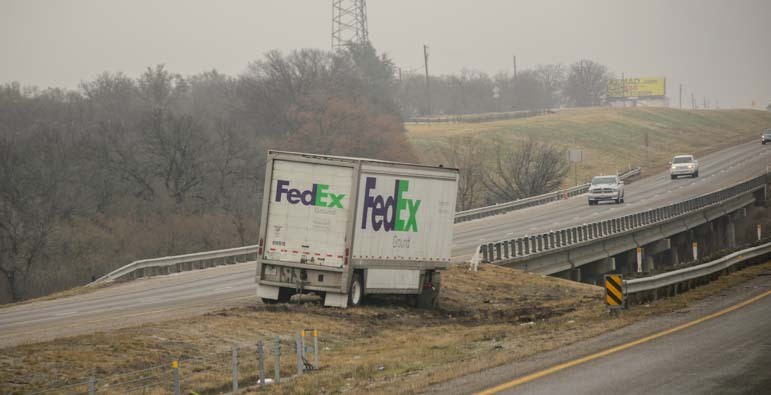 Hey, there’s a FedEx truck — was the driver okay? The front end appeared to be smashed. Mark whipped his head around as we passed it and noticed a huge hole in the windshield on the driver’s side. A mile further on we saw more. This is crazy! Another truck on its side!! Now our eyes were popping out of our heads. We rarely see wrecks on the highway, and especially not abandoned, mangled trucks. Signs ahead made us slow down. 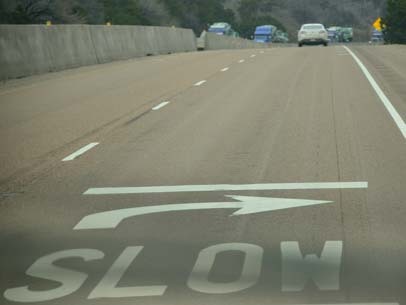 There was a 6% descent and the word “SLOW” was painted right on the freeway. If you missed the little yellow sign, here’s a big one right on the pavement! But it probably wasn’t possible to heed these signs on the fearful night of the ice storm. More wrecks lay ahead. We saw images of this truck later on in news reports. Yet another rollover a few miles further down the highway. 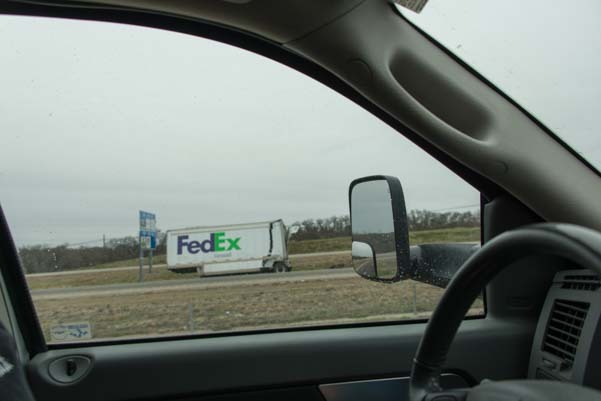 At the last moment Mark spotted a second Fed Ex truck stranded by the side of I-20. He leaned back as I snapped a pic out his window. By now I was perched on the edge of my seat, my mind racing as I tried to imagine what the scene had been like in the dark with snow falling and black ice everywhere. Now I understood why those people back in Marathon had been so rattled as they talked about what they’d experienced on the road that night. Suddenly there were lots of brake lights ahead of us. We slowed to a crawl and were herded off the highway for a detour. The freeway comes to a halt ahead of us. As we climbed a frontage road and looked down at the empty freeway next to us, we saw a semi-tractor trailer that had just been raised up from its side. Its cab was jacked to one side as if it had a broken neck. There were three wreckers and countless people in vivid orange working to get it removed. As we detour around I-20 on a frontage road, we see three wreckers removing a semi-tractor trailer. In the end, we counted ten abandoned truck wrecks and countless stomach-turning skid marks in the dirt going into the ditches by the side of the freeway. Looking for info later, we thought for sure we’d find dozens of news stories about the bedlam on I-20 around Eastland from that terrifying night, but this area had been a secondary story. The scenes on I-35 and I-75 around Dallas had dominated the news for that storm instead! Eventually, the wrecks subsided and I sat back in my seat, rather stunned by what we had seen. Just then, as if to break our mood and make us smile again, an antique hot rod appeared, headed in the opposite direction. 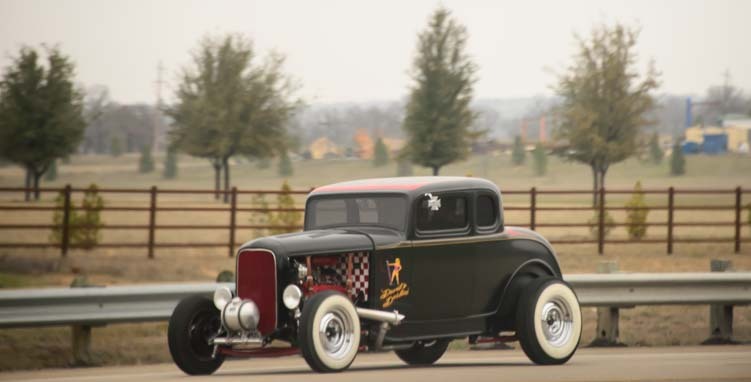 Finally, something to smile about — an antique hot rod! And so it goes, driving the wilds of Texas. It’s a jungle out there! This entry was posted in Quick Pics and tagged Non-Travel, Quick Pics, Snow, Texas by Roads Less Traveled. Bookmark the permalink. Super scary! Glad you guys took it slow and careful! It was, Nina, and we were very glad to find a cozy spot to hunker down before the next storm! Wow what crazy carnage! They just aren’t used to driving (or rather NOT driving) on that kind of ice! All we can do is hope no one was seriously injured! It was amazing to see, and looked truly horrific, but I’m hoping everyone was okay since there weren’t any big news stories that I could find. I think the real difference between these roads and further north is that they don’t use salt. When we lived in Austin, an ice storm that would be minor in the northern states where salt is used routinely would end up shutting down the city, schools, government, businesses and all, for three days!